Transform your outdoor space with these eight pro tips. 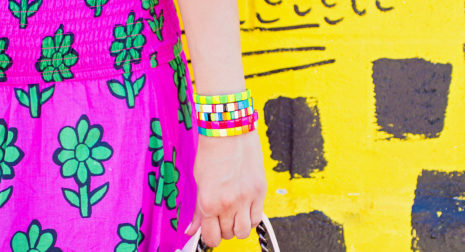 If you need a burst of sartorial sunshine, here ya go! This look left me speechless! Totally got emotional reading this from Kelly. Can’t believe I’ll be hosting Elle’s first birthday party in two months or so. Now, to think of creative ideas… Hmmm. Hmmm this is an interesting development. What are your thoughts? Seems to blur the lines a bit to me. Completely love this Forbes Day in the Life profile of one of my favorite jewelry designers, Mignonne Gavigan. Podcasts to help you eliminate negative self-talk (The Lively Show is Julie’s favorite!). Need to feel better about your coffee habit? Check out these 15 health benefits of coffee. Interesting take on how blogging has influenced entrepreneurship. Absolutely adore Jenn’s floral dress. Struggling with anxiety? Here’s how wellness and self-care can help you cope. The types of people you should have in your life by the time you’re 30. Adding this colorful one piece to my cart immediately. The perfect colorful striped sweater for spring and summer – and only about $50! How perfect is this off the shoulder top for everyday Summer wear? Cult Gaia nailed it with this trapeze dress. Adore! And what about this incredible tote of theirs? Need. Want. Love. Especially for less than $50. Still can’t get enough of these earrings. I have them in lavender, and now I want them in this shade. My friend Jenny was wearing this personalized denim jacket this week and now I’m pretty sure I need one. Pink tie dye? Yes, please! This brooch would look amazing on a denim jacket. The color blocking on this dress is pretty much perfect. Yep, pretty sure this book is calling my name. All the heart eyes for these mixed media statement earrings. Aw, thanks so much for including me! Cheers to the week ahead!